I’ve been trying to go meatless once a week partly to save money and partly just because I prefer it that way. It’s not easy with my meat-loving husband so most of the time I end up doing burritos or enchiladas since black beans can fool him. 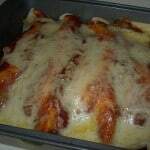 The husband has a favorite enchilada recipe but it uses chicken so I decided to try a new recipe. It uses 3 cans of black beans, half of which you mash. It also calls for a thin slice of cream cheese to be wrapped up inside each enchilada so I knew we had a winner here. He ended up loving these and didn’t realize there was no meat until he was done and I confessed. 3 Responses to "Smoky Black Bean Enchiladas"
I love meatless meals and we’ve been incorporating them in our weekly dinners as well. Even more so are carbless dinners since carbs happen to be our downfall. That’s great your husband didn’t even realize it was meatless! These sound wonderful!!! The orange juice sounds like it would add an interesting flavor. 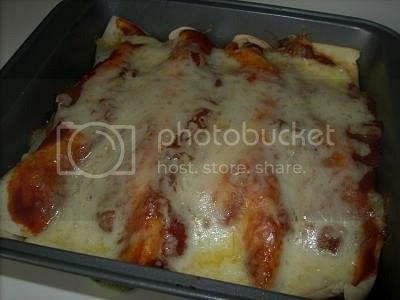 .-= Johnlyn´s last blog ..Frugal Recipe – Baked Pork Chimichangas =-. These sound so good and inexpensive too! 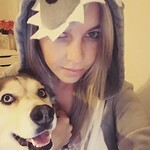 .-= Jackie´s last blog ..Now I Just Need to Learn How to Use It =-.